News Flash: I'm in print! See the October 2001 issue of Sky and Telescope magazine, on pages 6, 128, 129 and 132. They published the image that is second from the left in the banner above. 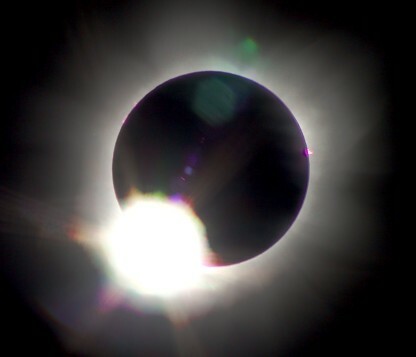 What is a total solar eclipse? 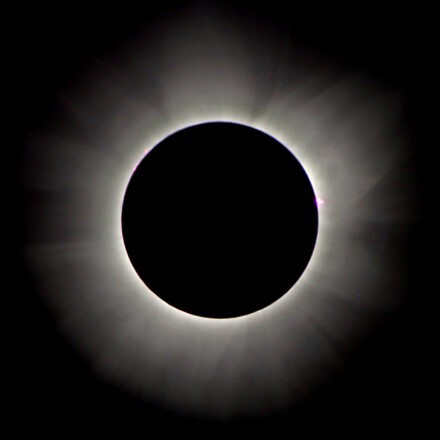 Well, through an amazing coincidence in geometry, every few years the Moon blocks out the Sun creating a solar eclipse. The Sun is 400 times the size of the Moon, and 400 times as distant, so they appear to be the same size when viewed from Earth. 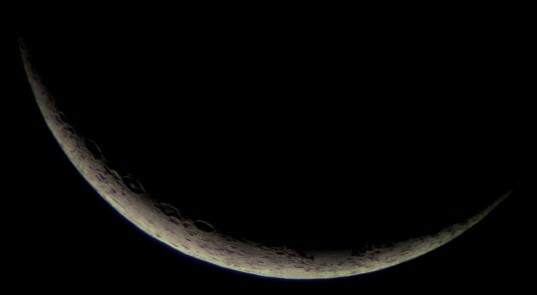 When the orbit of the Moon takes it between the Sun and the Earth, the shadow of the Moon is cast upon the Earth. If the Moon is close enough to the Earth, someone located near the middle of that shadow will see the Moon exactly block out the Sun in a spectacular show. 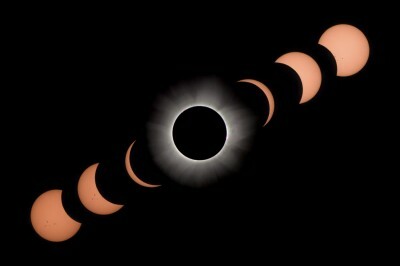 This is a "Total Solar Eclipse", arguably the most spectacular show in astronomy. 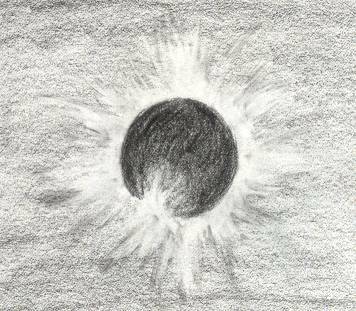 Total Solar Eclipses (TSEs) happen every few years, in strips laid across seemingly random parts of the globe. (Click here for a map of TSEs during 1996-2020, courtesy Fred Espenak of NASA). This time southern Africa was the place to be on June 21, 2001. The map at right shows the maximum eclipse experienced at locations across all of Africa, and is a mosaic made from my actual images of the eclipse. I wasn't comfortable with arranging the trip by myself as I was not familiar with the countries or what to expect. I therefore booked myself and my sister Monica on a tour offered by Astronomical Tours, a travel agency designed for amateur astronomers like me. Many tours book full up to a year in advance, and so I was lucky to get in on a cancellation. As part of this tour we travelled to Landless Corner, Zambia to view the eclipse. More info about the tour and what we saw (besides the eclipse) is available in the full trip report. All photos on this page and the trip report pages were taken by me (Fred) or by Monica (my sister). Our day began in Livingstone, Zambia at the first-class Zambezi Sun hotel, adjacent to Victoria Falls. We flew to Landless Corner on the Victoria, a sixty-year-old DC3, and landed on the grass strip prepared by the Landless family. We picked out our observing site, near some shade trees, and began setting up. I was fully set up in 10 minutes, but other folks took 1-2 hours to get going. Preparation and simplicity pays off big time in a place like this. 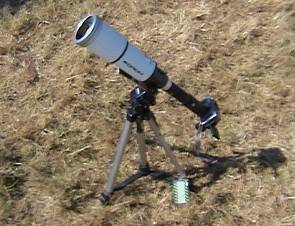 Other members of the group had suffered problems like a broken ETX telescope mirror, a broken tracking motor, and so on. 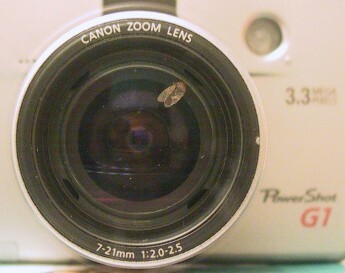 I had no equipment damage on the trip until the last day, when a small bug crawled between the glass elements of the lens in my digital camera. Don't ask me how it did it! Don't forget to check out the full trip report at some point. 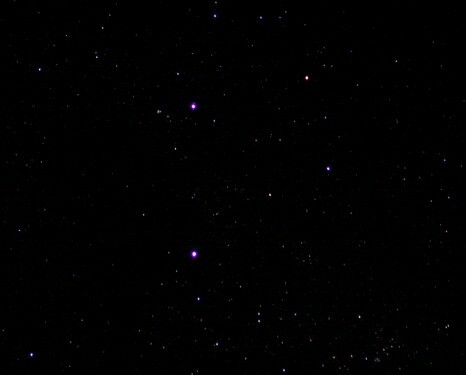 We observed from Landless Corner, Zambia, which is north of the capital Lusaka. This site was singled out in Fred Espenak's bulletin about the eclipse, because it was within a couple kilometers of the line of maximum duration, and around ten kilometers from the centerline. The Landless Corner Farm is owned by Ron and Megan Landless, whom we had the pleasure of meeting while there. Ron was directing the airplanes and Megan oversaw the excellent lunch that was prepared for us. 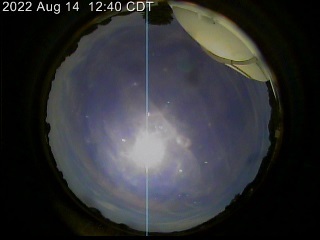 The telescope and digital camera combination took many weeks to figure out. 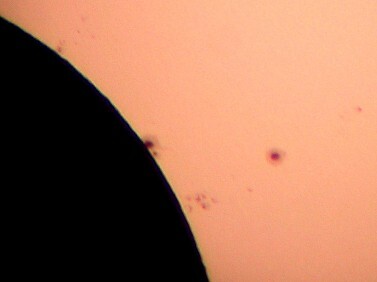 I wanted to be able to zoom out to get the corona, and zoom in to see sunspots and prominences. The difficult thing was getting the camera lens close enough to the eyepiece, and finding an eyepiece with glass right at the top with no eyecup. I used the IR remote to fire the camera instead of a cable release, and took advantage of the camera's AEB (Automatic Exposure Bracketing) feature extensively during totality. 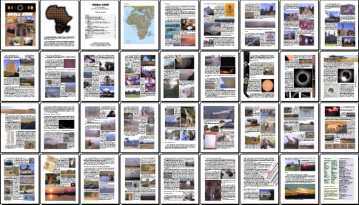 All images on this page were taken at 50 ASA unless otherwise noted. Over the entire trip Monica and I took about 1,200 digital photos, 125 film photos, and 3.5 hours of video. 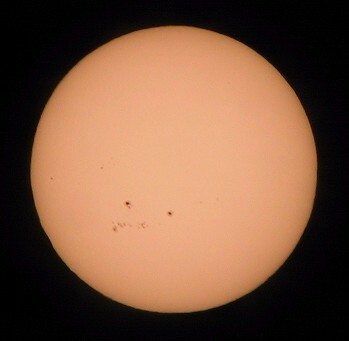 225 photos were of the eclipse itself (through the telescope). High Resolution (4.7MB, recommended for screens larger than 800x600, and for printing). Low Resolution (1.5MB, recommended for 800x600 or smaller screens). Epilogue: The 59-year-old DC-3 airplane (Victoria) we flew in crashed in the Congo six months after our trip. All text and images are © 2001 Manfred Bruenjes - All Rights Reserved. Image inlining is strictly prohibited. Email for permission before using an image or text.